Futures for the Dow Jones Industrial Average today (Thursday) gained 32 points in pre-market hours as investors await word from the leaders of the European Central Bank. 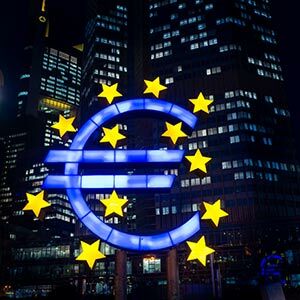 The ECB President Mario Draghi is expected to announce further stimulus to bolster the struggling Eurozone. Meanwhile, investors anticipate U.S. Federal Reserve Chairwoman Janet Yellen will further justify an interest rate hike next week. The expectations suggest a diverging path for the two central banks and could push the U.S. dollar toward parity with the euro in the future. Yesterday, the Dow Jones Industrial Average fell 158 points after Yellen bolstered the case for an interest rate hike in December but said the event would still rely on data to justify the central bank's decision. Oil prices slumped further on already bad news that the U.S. manufacturing sector is weakening. The Fed's Beige Book suggested evidence of a sector-wide contraction was not an aberration. The Stock Market Today: Investors will listen to speeches from three members of the Federal Reserve, including chairwoman Janet Yellen. Investors are also reacting to the weekly jobless claims released by the U.S. Labor Department ahead of tomorrow's critical November unemployment report. Oil Outlook: Oil prices regained some footing this morning on news Saudi Arabia has proposed a plan to offer some price support and balance the global crude markets. The news comes after domestic prices fell below $40 yesterday for the first time since August as a struggling U.S. manufacturing sector and a bearish EIA supply report weighed on trader sentiment. In pre-market hours, January WTI prices added 1.8% to hit $40.70 per barrel. Meanwhile, Brent oil – priced in London – gained 2.4% to hit $43.54. Earnings Report No. 1, ULTA: After the market closes, Ulta Salon, Cosmetics & Fragrances Inc. (Nasdaq: ULTA) will report fiscal third-quarter earnings. The company is expected to report per-share earnings of $0.83 on top of $732.5 million in revenue. Earnings Report No. 2, AMBA: Later this afternoon, Ambarella Inc. (Nasdaq: AMBA) will report fiscal third-quarter earnings. The pharmaceutical company is expected to report an EPS of $0.89 on $91.47 million in revenue. Additional companies reporting earnings include Kroger Co. (NYSE: KR), American Eagle Outfitters (NYSE: AEO), Barnes & Noble Inc. (NYSE: BKS), Dollar General Corp. (NYSE: DG), and Medtronic Plc. (NYSE: MDT). Stocks to Watch No. 1, BABA: Despite rumors, Alibaba Group Holding Ltd. (NYSE: BABA) is not really interested in purchasing the web business of Yahoo! Inc. (Nasdaq: YHOO). The latter's board of directors is currently meeting to discuss divestiture strategies as it struggles to keep up in the digital advertising market against its primary rivals in Alphabet Inc. (Nasdaq: GOOG, GOOGL) and Facebook Inc. (Nasdaq: FB). So, who might buy Yahoo's web business, and when? You can find that answer, right here. Stocks to Watch No. 2, DYAX: Shares of Dyax Corp. (Nasdaq: DYAX) jumped more than 12% on news the biotech firm has received early approval to proceed with its plan to be acquired by Shire Plc. (Nasdaq ADR: SHPG). Stocks to Watch No. 3, ZFGN: Shares of Zafgen Inc. (Nasdaq: ZFGN) plunged another 7% this morning after falling more than 60% on Wednesday. The pharmaceutical company saw shares crater after the FDA announced it was placing the trials for an experimental obesity drug on hold until further review. Cleveland Federal Reserve Bank President Loretta Mester speaks at 8:30 a.m.
Federal Reserve Chairwoman Janet Yellen speaks at 10 a.m.
Federal Reserve Vice Chair Stanley Fischer speaks at 12:30 p.m.